VIBE Audio is pleased to announce the next generation of our best selling series of SLICK amplifiers. The new SLICK amplifiers are available in Stereo 2 Channel, Stereo 4 Channel, Monoblock Bass and for the first time in the SLICK range a versatile 5 channel amplifier. The new SLICK amplifiers are considerably smaller in size than the previous models, but by utilizing cutting edge Class D technology this smaller footprint is not at the expense of power handling with the new amplifiers capable to the same power outputs as the previous larger models. The SLICK Amplifiers new Class D circuit boards provide a smaller, more efficient package with improved sound quality. The SLICK amps achieve a more open sound through improved dynamics and greater transient response. The Class D Circuitry offers vastly improved thermal performance, increasing runtime by an average of 40%, whilst the new overwound power supply transformers provide a huge gain in dynamic headroom for 20% more usable power than the previous model. All Slick amplifiers feature low level inputs for the best possible audio quality. 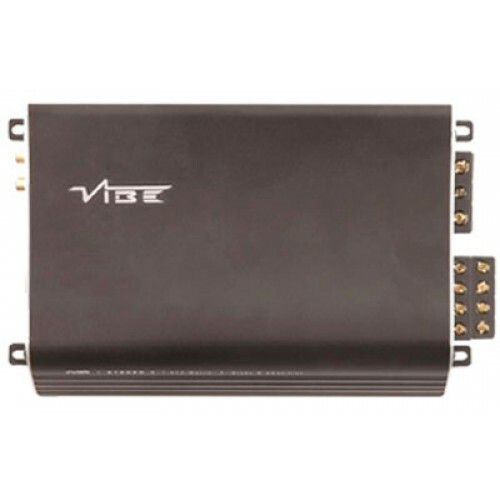 Also released in 2012 is the VIBE AutoSense High Level Convertor, perfect for connecting to the low level outputs on OE headunits, this accessory features AutoSense technology automatically turning the amplifier on without the need for a remote turn–on wire. The Slick Stereo amplifiers are available in 2 and 4 channel configurations and are some of the best value Stereo amplifiers on the market, packed with technology usually only seen in higher end models. Please contact DVB Car Audio with any queries on this item.